This project was to revamp the existing Accounting and Corporate Regulatory Authority (ACRA) website. 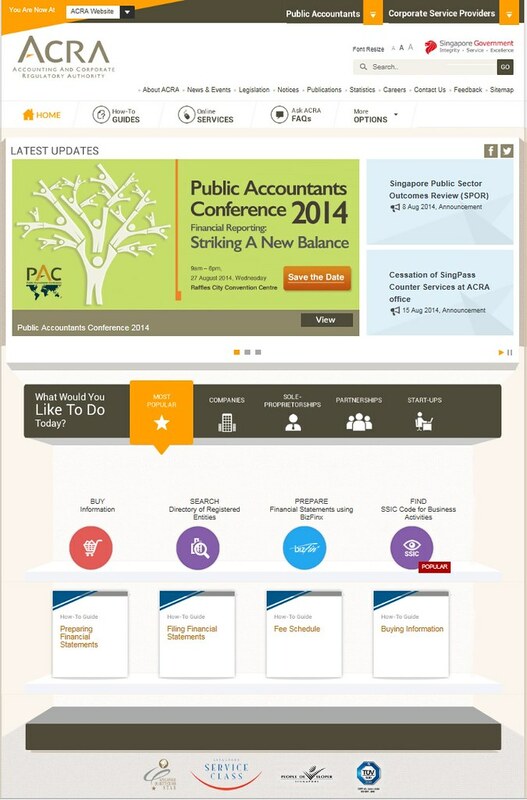 ACRA is the national regulator of business entities and public accountants in Singapore. This project was to revamp the existing Accounting and Corporate Regulatory Authority (ACRA) website. The website serves mainly 3 groups of users: Businesses owners (start-ups, limited companies and public listed companies and their administrators) Public Accountants and Corporate Service Providers. Business owners constitute up to 80 percent of users who regularly access the website with the latter 2 groups constituting the remaining 20 percent. The first issue with the existing site was usability. Accessibility of information regarding business set-up processes, license renewals, updating of particulars and announcing AGMs was challenging as it entailed the users having first-hand knowledge of ACRA’s departmental workflows and structures to be able to navigate through the entire functional processes successfully. After conducting usability studies, prototyping was done to test the concepts and functionality. This process was needed to validate labels for their intuitiveness and test the prototype for its usability, with the objective of allowing users to efficiently and successfully complete their top tasks. An innovative deck that displayed related content was used to improve categorization of information. The use of icons and infographics improved site navigation, making statistical data and complex reports more readable by lessening cognitive load. For the Public Accountants and Corporate Service Providers, the new website features ‘slideaway’ advanced menus that are aligned with a specific task focus to enhance navigation..
With the new site, there was a 95% improvement over the existing site, measured in terms of target audience Task Completion Rate. Surveys also revealed that the new site was well received by ACRA’s target audience with users describing the new site as ‘friendly’, ‘organized’, ‘clear’, ‘accessible’ and ‘professional’.